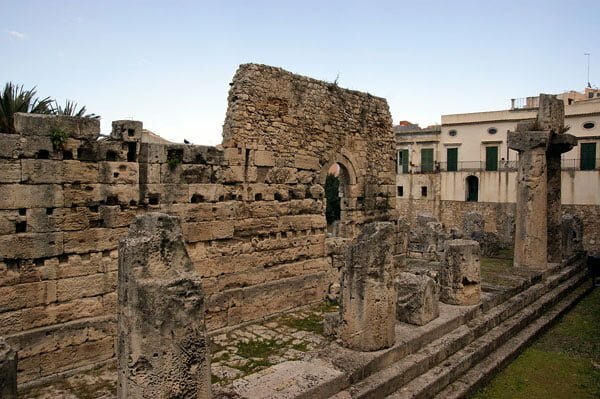 Once a Greek colony, Syracuse (Siracusa) still retains much of its original features. No other place in Sicily is quite like it. It is the perfect mixture of Greek classicism, Roman ruins and baroque architecture. If you didn’t hear the sound of Italian being spoken on the streets, you could be forgiven for thinking you were in Greece. 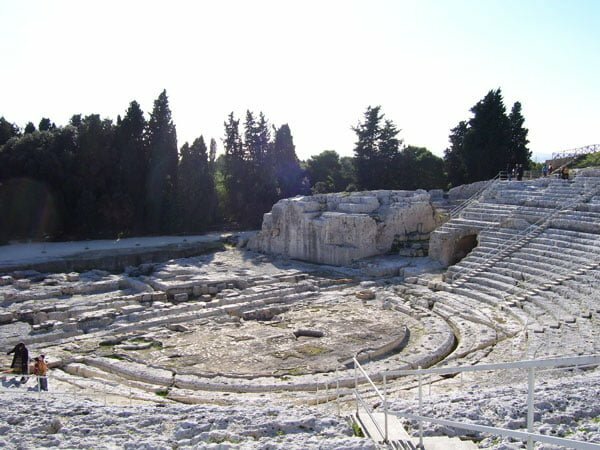 Such was its significance to the Greeks, Syracuse was once the same size of Athens during the 5th century BC. It was also the birthplace of Greek mathematician and engineer Archimedes. The city has exchanged hands many times, and been under the control of both the Roman and Byzantine Empires. Much of Sicily is a collection of Greek and Roman culture and architecture, making it a fascinating city to visit. Naturally, the city is a UNESCO world heritage site. Ortygia, known locally as Citta Vecchia, is the small island on which the historical centre of Syracuse (Siracusa) is built. This town is pretty old, dating back over 3,000 years. It was founded by Corinthian colonists in 734BC, and soon flourished into a rich commercial town. Due to its geographical location at the heart of the Mediterranean, it was a strategic stronghold during ancient times. The Romans invaded the city in 211BC, when they breached the city’s defences (designed by Archimedes) and the city fell under the control of the Romans. The city remained the capital of Sicily until the Byzantines took over. During the next 800 years, the city fell into a steady decline and succumbed to famine and plague. An earthquake in 1693 proved to be the rejuvenation of the city when it was rebuilt in a baroque style. Connected to the main town by a bridge, Ortygia is a warren of baroque streets and spacious piazzas. Here you will find Piazza Archimede, which is dominated by the ornate fountain of Diana. If you carry on heading down the Via Minerva you will stumble up the main square, Piazza del Duomo at the heart of the island. 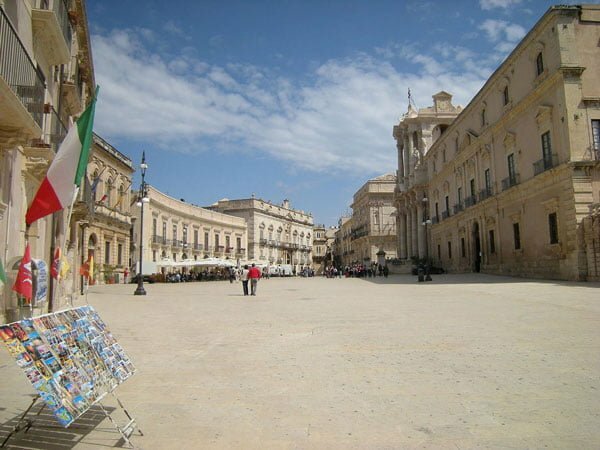 This spacious and charming square is filled with fine baroque buildings and is home to the town’s Duomo (cathedral). Other important points of interest on the square are Palazzo Beneventano del Bosco, with its beautiful courtyard and Palazzo del Senato (Senator’s Palace). Unlike most piazzas in Italy, Piazza del Duomo is an irregular shape due to the ancient layout of the old town. Recently restored, this large open space has a few bars and cafes with outside tables, which provide a relaxing way to take in this stunning piazza. The changing colonisation of Syracuse (Siracusa) and architectural styles is most evident at the city’s cathedral. The original building stood as a temple dedicated to the Greek goddess of Athena. Recent archaeological studies have found that at least two other temples stood here, making the site a place of worship since circa 600BC. The present cathedral incorporates the original architectural heritage of the temple with its doric columns, giving it a distinctly Greek feel. The baroque facade was a recent addition after the earthquake of 1693. Inside the duomo, there is a font made from Greek marble which is held up by 13th-century wrought-iron lions. It is free to enter the cathedral, so take the opportunity to escape the midday sun for a look around inside. At Piazza Pancali you will find the Temple of Apollo. The ruins of this Greek temple date back to the early 6th century BC. The temple is the oldest peripteral (having a row of columns on each side) Doric temple in the world. Like most places in Syracuse, it has had many owners. Cicero came to the island and announced that the temple was dedicated to Artemis. The Byzantines turned the temple into a church, the Saracens made it into a mosque before the Normans converted back into a church. Due to the significance of the site, it is fenced off but you can easily walk around it anytime you like. Perhaps the best attraction of Syracuse (Siracusa) is the Parco Archeologico della Neapolis (Archaeological Park of Naepolis). Set on a hill overlooking the city, the park contains three sets of old ruins from the ancient world. This park is quite large, and will require a bit of walking. It can be reached by bus from the bridge at the entrance to the old town or a 30-minute walk from the centre of Syracuse. At the heart of the park is the pearly white Teatro Greco from the 5th century BC. The theatre once held an audience of 16,000 people, and nowadays is still used for summer performances. Besides the theatre, there is the mysterious Latomia del Paradiso. This is a deep, precipitous, limestone quarry, out of which stone for the ancient city was extracted. It is riddled with catacombs, and once imprisoned 7,000 survivors of a war between Syracuse and Athens in 413 BC. And if that wasn’t enough, there is also a Roman amphitheatre used for the usual gladiatorial battles and chariot races. While it was destroyed by visiting Spaniards in the 16th century, you can still make out the outlines of it from the picture above. Flavours Holidays organise trips to Sicily to allow you to learn skills in: Cooking, Learning Italian, Painting, Photography or Pilates.